My favorite collage artist, Claudine Hellmuth, is going to be on Martha Stewart’s show on September 12th! This is so huge and exciting for her, appearing on Martha is, as you can imagine, the Holy Grail for crafters and I am so happy for Claudine (she’s such a sweety). I commissioned her to do the above piece for Mr. bookbabie’s birthday this summer and he loved it. Her work is so whimsical and joyful. If you’re going to be home, please be sure to watch the live show (or fire up the DVR so you can watch it later). 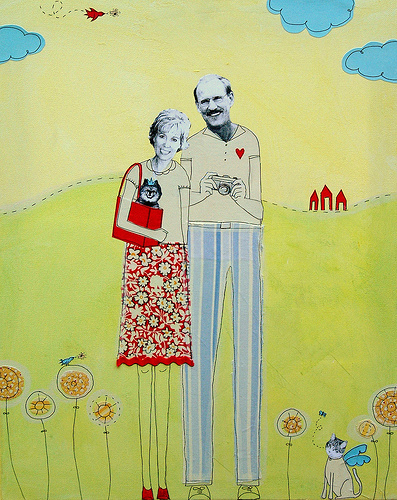 This entry was posted in art and tagged art, collage, my life by Lilli Day aka bookbabie. Bookmark the permalink.